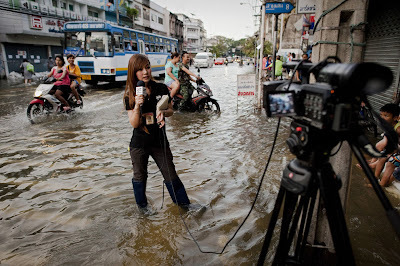 These pictures from The Atlantic will say more about the flooding in Bangkok, Thailand than this blog possibly could, so check out that gallery right now. And there's still more havoc to come. "In the worst-case scenario, if all the dykes break, all parts of Bangkok would be more or less flooded," Seri said. Yet the government is surprisingly lackadaisical about the country's worst disaster in nearly half a century. Prime Minister Yingluck Shinawatra, who said two weeks ago that Bangkok was likely to escape the floodwaters, said on Wednesday that it could be flooded for as long as a month. "But we shouldn't face water as high as two or three meters or staying for two or three months as we've seen in other provinces," she told reporters. They say Nero fiddled as Rome burned. Now, the Thai people are accusing the Prime Minister of squabbling as Bangkok drowns.